The 2018-2019 season is the first as the Marksmen Head Coach for the native of Sherwood Park, Alberta, Canada. 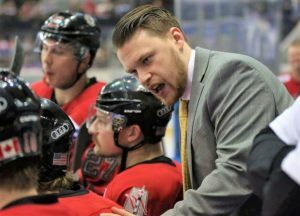 Kallechy comes to the Marksmen following a three year stint as an assistant coach with the Huntsville Havoc, including a President’s Cup Championship, during the 2017/18 season. Prior to stepping behind the bench, Kallechy donned goalie paraphernalia, suiting up for four different SPHL clubs (Knoxville, Pensacola, Louisiana, Huntsville), over the course of a four year playing career (2011-2015). During that span, the 28-year-old registered a 3.15 goals against average, accompanied by an 89.6% save percentage. The 2018-2019 season is Jordon Kadlik’s first with the Marksmen, and his second working as a professional equipment manager. 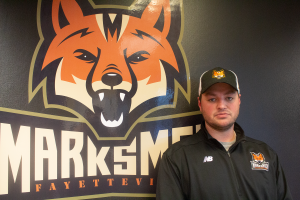 Kadlik comes to the Marksmen after spending a season-and-a-half as a player/equipment manager with the Knoxville Ice Bears, and working more recently as the Pro Shop Manager at Biddeford Ice Arena in Maine. A Graduate of Nichols College, Kadlik got his start here as an Equipment Manager intern for the school after being the Men’s Ice Hockey Equipment Manager for two seasons. Following his time here, Kadlik worked as Colgate University’s Equipment Manager. The 26-year-old’s hobbies include hockey and golf. He has an American Bulldog/Jack Russell mix named Nelly whom made the trek with him to Fayetteville. 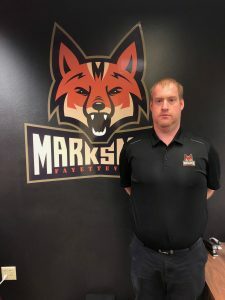 The 2018-2019 season is Kyle Sherrills’ second with the Marksmen as the Head Athletic Trainer. He has been involved in minor league hockey in Fayetteville since 2007. A native of Red Springs, NC, Kyle earned his Bachelors of Science in Athletic Training from Methodist University (Fayetteville, NC). He also minored in Physical Education as well as Strength and Conditioning. He has been a BOC certified Athletic Trainer since 2008. He was a member of the medical staff for the Fayetteville FireAntz, SPHL championship season (2006-07), and the FireAntz Regular Season Championship (2012). He was also a member of medical staff for the Fayetteville Guard, NIFL Championship season (2007) and the Cape Fear Heroes AIF Championship Season (2012), SIF Championship Season (2017). Along with his passion of working with professional athletes, Kyle also enjoys providing athletic training services youth athletes in the Cape Fear region. Kyle has been a member of the NATA since 2005 and enjoys using his knowledge to educate the community in sports medicine.